At Coolum Copy & Print Centre, we provide a wide range of products and services for our customers. Whether its simply black & white photocopying or full colour digital printing, we can deliver a quality product in a timely and cost effective way. From design to finished product, our professional and qualified team can help you through the often daunting task of ‘knowing where to start’ in getting your job done. Whether it’s a business card or a complex design and print job or web site, we offer guidance and our expertise to ensure your job is completed to your specifications, and within your time frame. We also provide a range of business stationery & document finishing services including binding, laminating, self inking stamps and mailing insertion. Be sure to contact Coolum Copy & Print Centre before you commence your next project to discuss your requirements with us. Full colour and Black and White Digital Photocopying services. We also provide a full range of Flyers and Brochures. 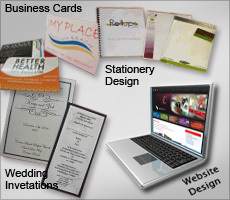 We offer a full range of Quality Business Cards, Letterheads and With Comp Slips. We also provide self inking stamps and Invoice Books. We can supply premium quality Fridge Magnets to help promote your business and impress your customers. All Graphic Design done on site. Corporate Logos designed from $450.00. Artwork services for Business Stationery, Advertisement, Wedding and Birthday Invitations and more. A1 & A2 sizes available. Ideal for building and engineering plans. Full colour posters for your business, special event or personal use. Comb Binding gives you a Simple and Economical way to bind your documents, presentations, resumes and school projects and give them a professional look. A full range of Laminating services is also available plus typing services, sending emails and fax service. Coolum Copy & Print Centre has the professional equipment to take and develop quality Passport Photos. Fast and efficient! Turn your photos into long lasting artwork for your home. We can supply you with high quality canvas prints, locally produced to Gallery Quality finish and ready to hang. See in store for sizes and prices.